Home » WOD Blog » Birds of a feather…. Notes: Wear long pants, socks or some type of shin guard! Notes: This WOD is 12 minutes total, including rest intervals. 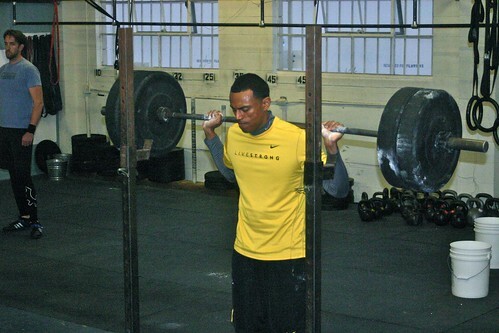 Advanced athletes can perform the deck squat into a pistol, alternating legs – DEMO. The quote above reminds me how difficult changing lifestyle habits can be. Choosing not drink with your friends and family, trying to explain your need to get to bed early to go for a run in the morning…. (on a weekend!! ), why you’re not eating this or that at the dinner table can be a tricky proposition. To some extent, we are products of our environment and the choices we make, especially ones that relate to diet, can sometimes be perceived as threatening to those that make up our inner circles. You’ll know the difference when someone takes a genuine interest in what you are doing and when they are simply making note of the fact that you are doing something “different”. Just remember, they wouldn’t bother to question anything had they not noticed your hard work. They notice the weight you’ve lost. They notice the healthy glow in your face. As we finish out these last few weeks, you are now the change people want to see in themselves. Rock on!